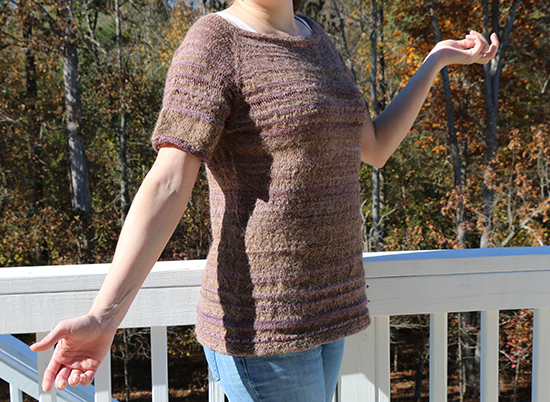 While I was spinning my Purple Llama yarn, I envisioned knitting it into a flowing, lacey top. I wanted the stitches to be open to highlight the fuzziness of the yarn. The lacey top didn’t turn out as I imagined it would. It happens sometimes in the world of making that the idea we originally think is the best ends up — well, not the best. I fell in love with the more tightly knit version of the yarn. In this yarn’s journey, I had already tried knitting it on US-5 (3.75 mm) needles. The result was fabric that looked both fuzzy and matted. I moved up to US-7 (4.5 mm) then finally US-9 (5.5 mm) needles in order to achieve an airy fuzziness. 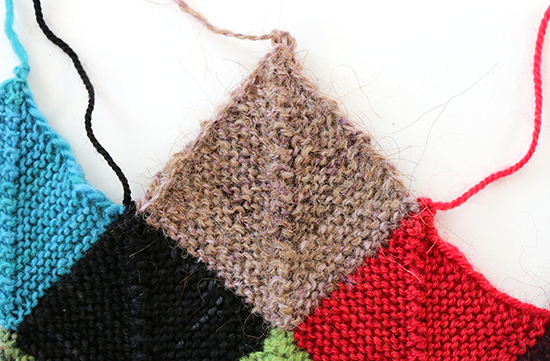 I hadn’t thought to try smaller needles until I pulled out the US-1 (2.25 mm) needles that I use on my scrap blanket. I expected a tight, matted fabric but the smaller stitches kept the fuzziness in check for beautiful results. I set off to find a new pattern for the yarn that called for smaller needles, and decided on La Grasse Matinée by Anna Johanna. It’s a loose top that is knit with US-1 1/2 (2.5 mm) and US-2 1/2 (3.0 mm) needles. And it only uses about 1,000 yards of yarn, which is about all I had. I decided to knit size L (96 cm bust) on US-2 (2.75 mm) and US-3 (3.25 mm) circular needles, which are the closest needle sizes I have to the pattern directions. The pattern knit up smoothly without any problems, and was surprisingly not boring given how much of the top is plain stockinette stitch. There is an eyelet detail on the lower edges of the body and sleeves, and garter stitch minimizes curling. I had to shorten the length of the sleeves because I was running out of yarn, but otherwise I didn’t make any modifications to the pattern. The fit is great, and I would knit La Grasse Matinée again. One of my initial concerns with the yarn was that it would feel scratchy against my skin. I’m happy to say that the scratchiness is minimal. The llama is technically hair and, sure enough, that’s what it feels like. As someone with long hair, I’m already used to a certain amount of hair pokes and random strands getting caught up in clothing fabric; wearing this top felt like more of the usual. It can be easy to get caught up in thinking the first idea is the best idea, but my journey with this yarn has been a great reminder not to shy away from experimenting. Letting go of preconceived ideas can be difficult, but so worthwhile! Have you made any recent projects that ended up completely different from what you originally planned? It is beautiful and looks good on you. Congrats! on your newly completed knit top. Let's hear it for Plan B!! Thank you! I like it when I don't have to go any farther than Plan B. What a sweet top! You tickled me when you mentioned shortening the sleeves. I do that sort of thing all the time when sewing. I've been following along with the story of this yarn, so I'm thrilled that I found this post and get to see the fabulous end result. I think I mention before (but just in case), I love the eyelet detail! It's a classic, feminine touch that adds to your beautiful colors. Thank you, Mary! I'm happy that the shortened sleeves still work with the top. I agree that the eyelet detail adds the right touch.